During my last minute road trip, I booked lodging in Polebridge, MT, on the edge of Glacier National Park, less than 24 hours in advance. That I found a funkily furnished ger, a round tent-like structure created in Mongolia, with a real bed, a private compost toilet and an outdoor shower on short notice, thrilled me. I could enjoy the outdoors without being crammed in a tent. To ensure a smooth visit, the ger’s owner called me with instructions as she wouldn’t be around when I arrived. “A pack of wolves is roaming the area so there’s no cooking allowed,” she said. “That’s fine,” I said, referring to the no cooking part, “but can I heat water for tea?” I hoped the wolves would keep their howling to a minimum so I could sleep. “There’s a Coleman camp stove you can use,” she said. I wondered if I’d be able to light it. Over the years, I had developed an aversion to camp stoves. Perhaps it started as a fear that if I even looked at a propane canister it would explode in my face. It didn’t help that at times the flames on indoor gas ranges have whooshed dangerously close, intensifying the already strong current of anxiety that runs through my body. Perhaps to camouflage that basic fear, my ego developed the story that cooking outdoors was something other people did, not me. Was it a gendered belief that outdoor cooking was for males, not females? Or a notion based on my upbringing that “Jews don’t camp”? 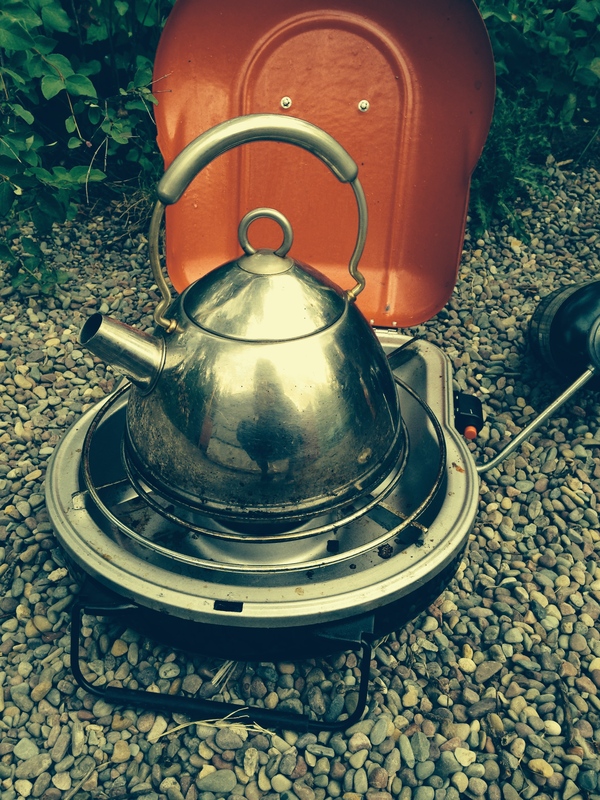 Was it snobbery that “real” cooking couldn’t happen on a camp stove, so why bother? Had I told myself that since I hadn’t learned to use a camp stove in my youth, it was now “too late” to try? Regardless, the belief that cooking outdoors was “not for me” became entrenched in my self-image to the point that, during the decade or so I hiked avidly, I refused to even try lighting stoves the few times I backpacked or camped with others. While a person can live a good life without touching a Coleman stove, the strength of the resistance I faced disturbed me. It was as if those ideas, beliefs and aversions had braided themselves into a rope that kept me hogtied, preventing me from performing a task that could enhance my life. I arrived to Polebridge just before 7pm on a Saturday, after driving 360 miles. I barely had enough energy to unpack my belongings, let alone assemble dinner from my cooler. I knew that eating cold food would be more pleasant if I had tea. A silver kettle and a bottle of water sat on a table inside the door to the ger. The red camp stove, along with two dark green propane canisters, rested in a black carrying case. I took the stove out of the case, looked at it as if it were my nemesis, decided I was too tired to deal with it, and stuck the contraption back inside. I assembled a light meal, opened my water bottle, sat on a camp chair and ate. Still, I wanted some tea. Mid-meal, I removed the stove from the bag, placed it on the ground, and flipped through the instruction manual. The intimidatingly small print made my eyes hurt. I folded the manual and put it and the stove back in the bag. Maybe it would have to wait until the morning after all, when my brain had stopped spinning from eight hours behind the wheel. I finished eating, stowed the garbage so the wolves wouldn’t smell it, and sat outside. That I did not have my customary tea began to annoy me as much as the mosquitoes who wanted to eat me for dinner. I considered walking half a mile to the Polebridge Mercantile and buying some there, but doing so would tighten that rope even more. Given the latitude, just 22 miles from Canada, there was still daylight remaining, enough to try again. I unpacked the stove, the canisters and the manual, sat them and myself on the ground, and started from the beginning. I gave myself permission to not succeed; the point was simply to make an attempt without a sense of urgency. I popped the black cap off a propane canister. I screwed the canister onto the metal arm connecting it with the stove. As I did so, the escaping gas made a hissing sound. I didn’t recoil, and nothing exploded. No wolves howled, either. I checked the connection and noticed that some threads on the canister were still visible. I slowly unscrewed it and fastened it properly. Following the instructions, I turned the stove dial to “high” and clicked the red ignition button. Pale blue flames began to flicker around the burner. I placed the kettle on the stove. As the water heated to a boil I marveled at what had happened. In about five minutes, a constricting self-image had unraveled, making what had long felt impossible not just possible, but easy. In Feldenkrais terms, I had given myself enough approximations to the desired goal so that, eventually, lighting the stove was simple. That I first needed to familiarize myself with the stove, then put it away, then glance at the manual, and put that away, eventually linking the steps, resembled a Feldenkrais lesson that gradually builds complexity rather than rushing to a result. Such iterative learning can seem odd in a culture where we expect to figure things out linearly and, if not on the first try, then within an implicit period of time. That there was no one around allowed me to learn at my own pace. Often, adults are uncomfortable witnessing clumsiness so they try to “help” someone by repeating instructions or physically intervening, interfering with the organic learning process. That I did not allow any self-criticism to arise allowed me to light the stove. Had I said to myself, “It’s your third try, it’s getting late, you better get it right,” I likely would have become flustered and failed. That I was able to sit with myself quietly and without judgment, I credit to Feldenkrais and Zen, which emphasize how we do things rather than what we do. On Saturday evenings, many Jews mark the completion of the Sabbath by lighting a braided Havdalah candle. Along with other rituals that engage all five senses, the service differentiates the holiness of the day that is ending from the rest of the week. While I don’t participate in this ceremony on a regular basis, it can be a powerful way to become present to the moment and to the transition from one day to the next. Lighting that camp stove was my own unforgettable Havdalah, distinguishing freedom and choice from fear and constraint. I’ll raise my cup of tea and say L’chaim to that. Great story about your road-trip! I’ve had a Feldenkrais book on my shelf for years. Now I’m finally going to read it. That’s wonderful! I hope the book inspires you to try a class, even if you haven’t already done so. It’s one of those experiences that words can’t really point to (which makes writing about it a fun challenge!). Ilona – your posting here is thoughtful and inspiring. very timely, too. so much so that I asked my dentist if we couldn’t approach yesterday’s appointment to repair a deep cavity as a challenge. I’m deeply conditioned, from childhood and onwards to fear dentists, their needles and their drills. yesterday we dispensed with the needles and the numbing, and we also dispensed with the anxiety, sweating, fear bordering on panic. we agreed to challenge the past, as I sat quietly, in observation of the surroundings. you have your Coleman camp stoves. others of us have dentists, cavities, and needles. your kind and thoughtful words are very much to the heart of the matter — distinguishing freedom and choice, from fear and constraint. the dentist’s chair is not really any different than the Feldenkrais classroom, our own experience with movements that sometimes results in releasing stagnant behaviors – sweating and panics from decades ago – fears and anxieties that somehow “got stuck” – and today the reasons for who we are, why we might have lost touch. thanks to your insightful words, re-embodying and presence to the moment are possible, even in the dentist’s chair. Thank you for sharing your Feldenkrais story and letting me know that my post was helpful in some way. That means a great deal to me, and inspires me to keep sharing with writing! Practicing in a dentist’s office is HUGE, especially if needles are involved, congratulations to you! You just reminded me that some time ago I wrote a post called “Dental Chair Delight: Is it Possible?”. Maybe it is! Yes, it is possible! and I know that from my own experience. Perhaps the Dental Chair Delight comes to us, when we are ready for it. Self-awareness is a key ingredient, at least for me.